The Oregon state seal identifies government buildings and officials and is a center piece for the Oregon state flag. 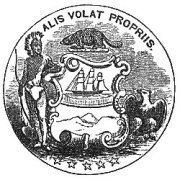 Fact 1: The "Salmon Seal" was used during the Provisional Government that ran from 1843 to 1849. Thirty-three stars surround the shield representing the number of states upon Oregon's entry into the union in 1859. The departing British man-of-war symbolizes the departure of British influence in the region and an arriving American merchant ship symbolizes the rise of American power. The Conestoga covered wagon and ox team represents the early pioneers and settlers who travelled to a new life in Oregon. In 1845 the number of settlers who used the Oregon Trail exceeded 3,000 people. The early industries of mining and agriculture, that were important to the economy of the state, are represented by the images of a sheaf, a plow, and a pickaxe. 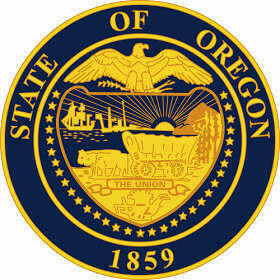 The Oregon seal is kept and used as required by the Constitution and laws of the state. 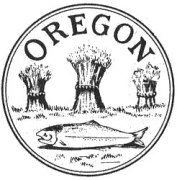 The Oregon seal was originally adopted in 1843 and was then replaced with the seal "The Union" during the American Civil War. 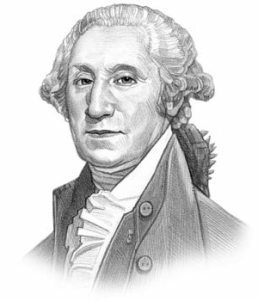 The original seal was re-established in 1987 as the legislature felt it better reflected the independent spirit of Oregon meaning that objectives and goals could be achieved without expecting help from others. This is the 1876 design of the state banner showing the state capitol of Salem.